Mumbai is a beautiful city that has a lot to offer its inhabitants. There is something about this ty that is pretty hard to explain and can only be experienced. Without a doubt, a life in Mumbai is a life well lived! Today, Mumbai is one of the most loved cities in the country, a city that caters to every need of its residents. There are many new locations in Mumbai that continue to evolve each day, but none can keep up to the pace of Kanjurmarg. Being one of the oldest developing areas in Central Mumbai, Kanjurmarg goes through constant development each day and is known for its institutions, well-planned infrastructure, employment hubs social zones and more. As this locations keeps getting better by the day, so does the real estate market. In fact, some of the largest real estate giants have a firm hold in Kanjurmarg’s real estate. With a number of luxurious residential projects and skyscrapers coming up, Kanjurmarg is a rising start in Mumbai’s property market today. As property prices in Kanjurmarg keep increasing at a steady rate, many investors and home buyers are purchase property at this fabulous location. Since Kanjurmarg is now home to a number of gated communities and residential projects offering modern-day living, a significant increase and improvement in social infrastructure, connectivity can purely evident. 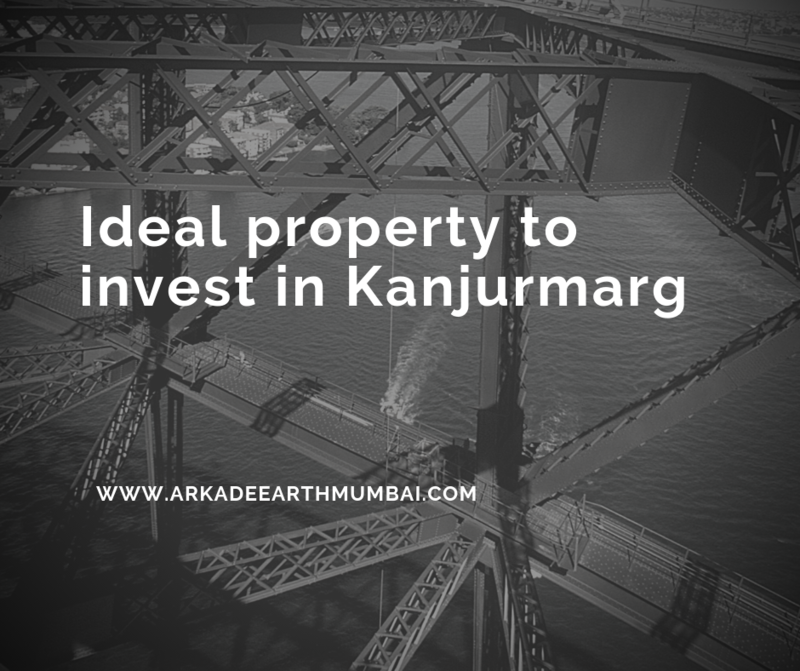 If you are looking out for better returns and sustainable profits, Kanjurmarg is the ultimate destination to invest in. Arkade Earth is an extravagant residential project at Kanjurmarg, Mumbai by Arkade Group that offers a premium luxury and comfort that is simply outstanding. Spread over 4 acres, this development offer variants of 1BHK, 2BHK and 3BHK apartments with apartment carpet area sizes starting at 447 sq. ft. and going up to 1052 sq. ft. Packed with extraordinary internal and external amenities, this development is simply impeccable. You will find apartments that are spacious, provide natural lighting, cross ventilation and contain an oxidized aluminum sliding windows, vitrified flooring in master bedrooms, vibrant kitchens with granite counters, stainless steel sinks and multiple provisions, safety features, etc. The external amenities at this development recreation a meditation centre, theatre, Wi-Fi connectivity, multipurpose hall, dedicated tennis court, basketball court and other sports facilities, a play-area for kids, jogging track, landscape garden, car parking facility, power back-up and high-end security with CCTV surveillance. Starting at a price of Rs.92.60 lakhs and moving up to Rs.2.08 Cr., the apartments at this development are affordable and simply irresistible. May it be a new home or an investment, a purchase at this development is definitely worth your savings. You can choose from multiple payment plans along with home loan facilities, NRI services and more for a happy purchase.